Compare prices on car hire in Quimper from all the major brands and find the best deals. When you book through us, unlimited mileage and insurance are always included in the price given. 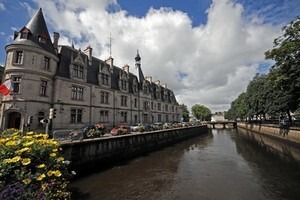 Quimper is a city in the northwestern part of France , in Brittany.Quimper is the capital of the Ministry of Finistère. The city is located 71 km southeast of Brest, on the River Odet. Approx. 64,000 inhabitants live in Quimper. The city has been a Catholic bishop from 400’s. Quimper is the ancient capital of La Cournoaille in Brittany, and has several Celtic symbols. The name is Breton for total flow, pointing to the three rivers Steira, Oddet and Frout that flow together here. The city has several medieval buildings, including a Gothic Cathedral St. Corentin that began in 1239. It has two towers and was reconstructed in The 1800s.Quimper has sights Fience Museum, Museum of Fine Arts Musée des Beaux-Arts, and a contemporary art museum, Le Quartier. Third week in July hosts Quimper dance festival Cornouaille with more than 200 events. The city’s most famous product is Quimper faïence products: hand-painted ceramics. Visitors can taste the traditional cider and crepes. The nearest airport is Brest Airport, seven kilometers from the center.